Today is one of those days that puts Coloradans on edge. It will be first of many this year. It’s not our first Red Flag Warning (high fire danger) day, though I think it’s the second day with humidity <5%. One thing is for sure: the gusts have whipped up tonight. And my lips feel like paper. While we’re adjusting quickly to the drier weather – following a wet winter, even – this early need to water everything has got us scratching our heads, licking our lips and crossing our fingers. In fact, this fire just flared up today, one county west of here (in a rural mountain town). Thankfully, evacuations have lifted, though containment data is unknown (containment means the firefighters have been able to hold a line of the fire at least 24 hours). Refrain from burning leaves or trash on windy days, etc. Sounds like common sense, but every year, we are amazed. We can’t be careful enough. The west side of Colorado Springs. 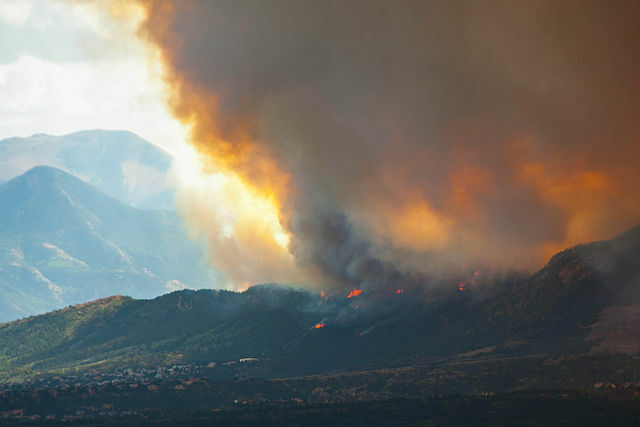 “Waldo fire approaching Mountain Shadows 2” by ttcosprings. Licensed under CC BY-SA 3.0 via Wikimedia Commons. Thankfully, casualties were minimal in the last two Colorado fires, but nearly 1000 families were displaced for at least a year, if not longer. Some still are figuring out how to rebuild. The Waldo Canyon Fire scar stares drivers in the face as we sit, facing west at traffic lights. The Black Forest Fire scar, across the highway to the northeast, is Waldo’s quiet counterpart. And both are part of us now. I love the Zen proverb quoted by fellow #YourTurnChallenge blogger Patrick Smith, that the obstacle is the path. Challenge, adversity, any kind of obstacle, really – they not only build character in us; they build beauty and identity. The weather the last few years has been crazy nearly everywhere. I guess it’s our turn to brace ourselves for the season ahead, pray for the best and prepare for the worst – including the resulting beauty. Same here. I love the mountains but give me some beach! The threat of fire is such a reality for so many. Thinking of you as you have this as part of your life there in CO. I love that quote as well, and already told Patrick I expect to be using it sometime this month in my own blogging! Yes quite the inspiration! Thanks, Susan. Stay safe, you all. Beach brings its own challenges, believe me. Tsunami warnings close schools around here. Beach is what’s in front of us, but we also live right up against a forest in drought country. I know the dread and fear of which you speak. Thank you! I grew up on the coast and only faced (well ok we left town) one hurricane. Basically, anything of beauty got that way with a harsh hand from the elements. I dread and love that at the same time. Yup. The risks are worth it to live every day in such beautiful surroundings.